Corrosion free, non-conductive and clean to handle, this non-conductive tower is ideal for use in areas of chemical hazard and electrical risk, as well as in the food industry where hygiene is important. Lightweight and suitable for glove free handling in the cold, they are also remarkably easy to transport, erect and take down. 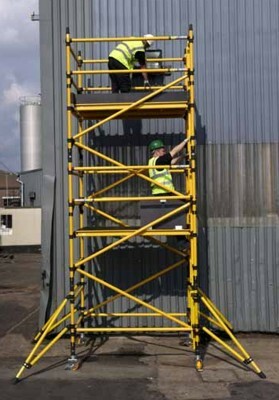 The towers' unique colour makes them easily identifiable on even the busiest sites. Note: Do not use access tower if the wind speed exceeds 17 mph. Note: Tower heights are shown to platform. Allow 1m for handrail height.